Bongawan - old shop houses. If your looking for something to do, why not take a drive along the south coast of Sabah to the quaint little town of Bongawan and it beautiful beaches . 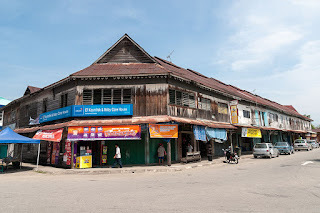 Bongawan is an historical town in the West Coast Division of the state of Sabah in Malaysia.. The town centre is 3 kilometers inland from the South China Sea and approximately 60 kilometers south of Kota Kinabalu, the state capital. It is also a stop on the North Borneo Railway. The main feature of this town is the row of pre war, colonial shop-houses. 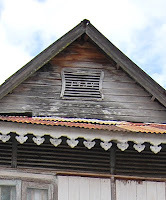 There are not many of these old buildings left in Sabah due to heavy bombing by the Australians who were trying their best to recapture Sabah from the imperial Japanese army during world II. The town of Bongawan was built in the 1920’s on the route of the North Borneo railway that ran from Beaufort to Jesselton and it was built during the rubber boom of those days. During the war many soldiers of the Japanese army were stationed at Bongawan and despite heaving aerial bombing by the Australian forces, a couple of rows of shop houses survived. 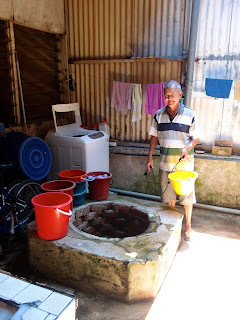 The propieter of the shop and the well . One row of shop houses apparently was started with 10 shop houses built in 1922 and the reminder added on in 1939. These old wooden shop houses are distinctively Chinese with influences of British Colonial style. Many of these townships flourished between the 1920-1930s because of the rubber boom of that era. 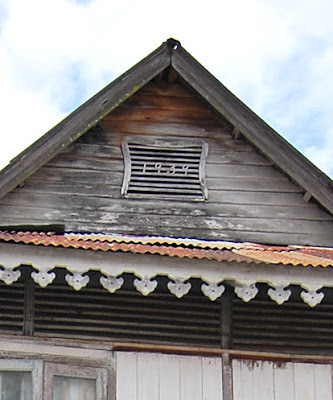 One of the corner shop houses in Bongawan has a window ornamentation with the date ‘1939’ on its gable. Chinese traders, most of who belong to the Hakka or Hokkien dialect groups, operate many of the shops. Another interesting feature of these shops, are the wells constructed in the Kitchen from which the owners used to draw water in the days of old. Today many visitors and locals frequent these coffee shops for a light meal of steamed buns or noodles and to partake in a refreshing drink of “kopi o ping” or iced black coffee sold in recycled glass bottles. Apparently, the name of the town -Bongawan ,comes from the Malay word bangau, which means 'egrets’ as these birds are commonly seen in the paddy fields surrounding the town. Besides the town, also visit “kenangan beach “ while your in the vicinity. It is only about 3 or so km from the town and is one of the cleanest beaches that I have seen in Sabah. It has miles of fine white sand with a constant cool breeze. There are also some stalls with tables and seats on the beach that are operated by local people of Brunei Malay descend. However most of the stalls only open in the evenings of weekends. They provide light snacks such as soft drinks , young coconut water and ABCs . ( Ais batu campur) a local favorite of shaved ice , tinned fruits and sweet syrup .Definitely a trip worth doing if you in Sabah .